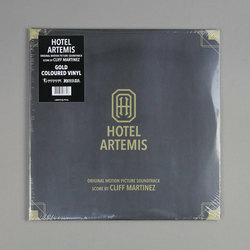 Cliff Martinez - Hotel Artemis (Original Motion Picture Soundtrack). Vinyl LP. Bleep. Ever since the release of the movie Drive in 2011 both film and music audiences have been crying out for another collaboration between composer Cliff Martinez and producers Marc Platt and Adam Siegel. Now, with 2018’s Hotel Artemis, their prayers have been answered. Martinez’s synth-noir style has become one of the most copied compositional techniques in modern cinema, but despite the multitude of imitators, there is still no-one who can match the former Captain Beefheart/Red Hot Chili Peppers man. This official soundtrack album also features an original tune from Father John Misty and tracks by The Mamas & The Papas, Buffy Sainte-Marie and Elyse Weinberg.